My wife and I were exploring the high country north of Santa Fe back in 2004. Near Dixon, NM, we spotted a dirt track that hugged the crest of a ridge as it snaked off into the wilderness. Although our rental car was not designed for the challenge, we could not resist the lure of what we came to call “The Beautiful Country,” so off we went. 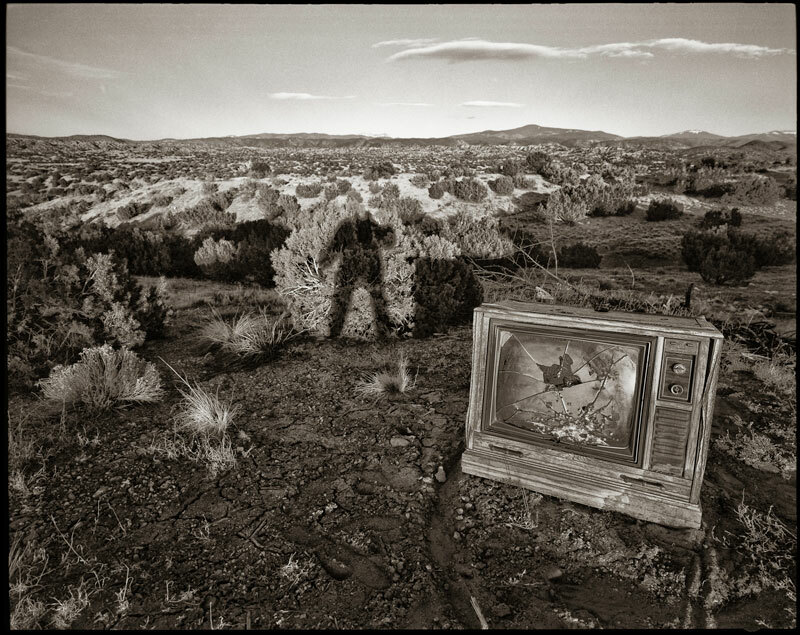 Deep in the wild, with no other sign of civilization in sight, we came upon the shattered hulk of a console television. The setting sun was low on the horizon, and long shadows were drawn across the landscape. Careful inspection reveals that the manufacturer of this TV was a company called Coronado. To find this set in the wilds of New Mexico, riddled with bullet holes, holds high irony. Francisco Vázquez de Coronado was a Spanish conquistador who led an expedition which explored this area of New Mexico in 1540. He was searching for the Cities of Cíbola, later known as the mythical Seven Cities of Gold. Needless to say, he never found gold, but he left a trail of brutality and plunder across the Southwest that still resonates today. Coronado was badly injured during the expedition, and on returning to Mexico was bankrupt and convicted of war crimes. He died of infectious disease in Mexico City at age 43. Did the people who hauled this TV into the hinterlands and shot it full of holes know this backstory? We will never know, but I prefer to think of this as 21st century retribution for crimes committed more than 4 centuries before.